I flew to Manila with my brother on 24 January 2016. We were in the capital for our interview at the U.S. Embassy for our immigrant visa petition filed by our dad some twelve (12) years ago. To complete our requirements, we had to be there earlier as we particularly needed to complete our medical examinations a week ahead of our interview schedule on 1 February 2016. Here is the diary of my 10-day Manila trip. We left Cebu at around 8:55 a.m. aboard a Cebu Pacific flight for Manila, Philippines. To our delight, Cebu Pacific's flight was not delayed this time. While the airline has a notorious reputation for delayed flights, we figured that the early morning flights should be the ones that are less likely delayed. It took a while before we could land at the Ninoy Aquino International Airport probably because of heavy air traffic. We finally touched down at 10:30 a.m. Wary about scheming cab drivers, we decided to book a cab through GrabTaxi assuming that would be the safest way to avoid being scammed in the big city. Our total bill for the cab ride from NAIA Terminal 3 to Bayview Park Hotel along Roxas Boulevard in Ermita, Manila came up at PhP 220 which included a humble tip for the cabbie who was pleasant and happen to be Visayan like us. Starving, we went out in search for food and ended up eating pork and chicken schnitzels at a MiniStop near the hotel block. PhP 182 was what we paid for our lunch. Shortly after lunch, we walked from the hotel to Robinsons Galleria to buy some groceries and a flatiron. We decided to take a cab back to the hotel and this was the first time a cab driver tried to scam us, first by taking a longer route until I turned on my Google Maps and he realized he can't do that to us, then by trying not to hand us our change (the meter read PhP 54 and we handed him a 100-peso bill). When we asked for our change, he muttered that he thought we'd let him keep the change. It was late afternoon, so we just stayed in the hotel and got comfortable with our room. I enjoyed a short swim at the roof deck swimming pool, did some cardio exercises on a stationary bike, and lifted some weights at the hotel gym. For dinner we had fried chicken lauriat and sweet and sour pork lauriat meals at Chowking not far from the hotel. Bill for dinner: PhP 366. We woke up early for our medical examination, had an early breakfast at the Ministop (Bill: PhP 265). We took a short cab ride (Fare PhP 44) and was at the St. Luke's Extension Clinic (SLEC) as early as 5 a.m. Despite that, a lot more people were already ahead of us (we got priority number 132 & 133. We went through the motions, did eye reading tests, had our vital signs measured, blood drawn from our veins for some laboratory tests, had chest x-rays, and had a physical check-up. Exams weren't over in a day and we were told to come back the next day to complete procedures. For lunch this day, we ordered a New Yorker pizza at Yellow Cab and paid only PhP 690 instead of PhP 790 because we had a PhP 100 discount coupon. This pizza would last us several meals. 26 January 2016 was an annoying one. We had to wait a total of at least seven (7) hours for vaccine administration to be completed and our medical results to be released. What made it more annoying was when we got to our hotel, we got a call from SLEC asking us to come back because they gave us the wrong report. In between the long wait, we had lunch at the Kilometer 1 (KM 1) Diner near SLEC. The liempo sisig at KM 1 made the day somewhat bearable. We paid PhP 750 for two (2) orders of liempo sisig, fried chicken tenders and a pancit canton platter. 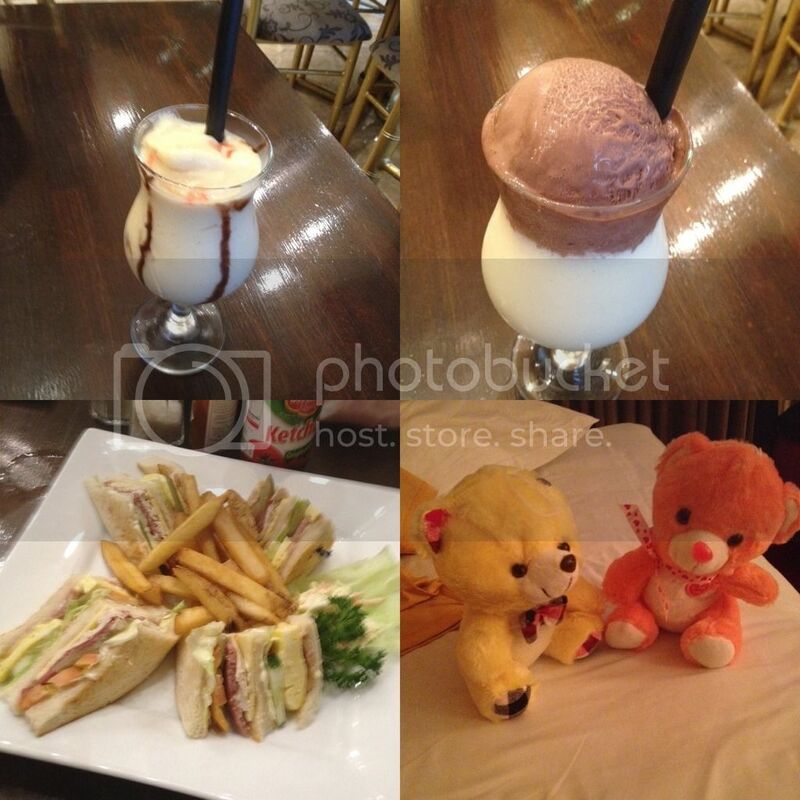 To cap the day, we had some mocktails and a clubhouse sandwich at the hotel's in-house restaurant and coffee and tea shop. Each order of the mocktail came along with a cute teddy bear so we got two (2) of that which we gave to our niece back in Cebu when we came back from the trip. This cost us PhP 808. With medical exams out of the way, we enjoyed an early morning leisurely swim at the roof deck pool and had another Ministop meal for brunch (Bill: PhP 227). I did another workout at the hotel gym before we headed out to the Philippine General Hospital (PGH) in the late afternoon to request for my brother's admission records from 1982. This day, we encountered another scheming cabbie who tried to scam us. A stupid move I should say as we even booked that ride through GrabTaxi. He tried to tell us the booking fee was PhP 70 instead of PhP 40 and entered a much bigger amount on the GrabTaxi app than what was registered on the meter. We paid him what was due him: PhP 75 on the meter (he entered PhP 120) and the PhP 40 booking fee. This incident was later reported to GrabTaxi and they promised to investigate and discipline the erring driver. Since we went to the PGH late, we had to come back the next day to complete our request. From the PGH, we took a cab (Fare: PhP 170) to the SM Mall of Asia (MOA) where we would dine at Burgoo (Bill: PhP 580). SM Advantage cardholders were entitled to a buy one, take one offer on the regular pork chops at Burgoo and we sure enjoyed that. I converted my Globe Rewards points to SM Advantage cards and we did some grocery shopping at the SM Hyfpermart before we headed back to the hotel. For the third time, a scheming cabbie tried to scam us. From the hotel to PGH, he wanted to do away with the meter and instead tried to contract us for PhP 150 justifying that the traffic was heavy. We didn't agree of course as we knew that our destination wasn't that far and there were no indications that traffic was heavy. We took another cab and the taxi meter fare only read PhP 96, or a total fare of PhP 86 after factoring the PhP 10 government-mandated discount. I handed the cabbie a 100-peso bill and let him keep the rest of the PhP 14 change. We were back at the PGH in mid-morning of the 28th to complete our request for my brother's medical records when he was still an infant. We were made to scour the old manual database to look for the dates of my brother's admission at the hospital in 1982. Scanning through the pages felt like we were doing historical research utilizing antiquated museum pieces. We did find the date of his admission but not the date of discharge. That was enough for the hospital to give us a certification. It was around 10 a.m. when we obtained the certificate so we decided to head to the SM MOA through the most cost-efficient way. We decided to take the Light Rail Transit (LRT) Line 1, then from the Pasay Rotunda, take a jeepney to SM MOA. We paid PhP 40 for the LRT ride and PhP 14 for the jeepney ride from EDSA-Pasay Rotunda to SM MOA. While it did save us a lot of money, I would have rather paid the extra pesos for comfort. At 10 a.m., the LRT was jampacked with people. I couldn't imagine how rush hour would be like. The coaches also looked old and the ride felt dangerous as in some instances, it appeared like the coach I was on would be dislodged. While at the SM MOA, we again took advantage of one of the offers on my SM Advantage Card, this time another buy one, take one offer on chicken dishes from Gumbo. Two filling chicken dishes and bottomless iced tea cost us PhP 637. For dinner, we ordered Salisbury Steak and Fried Chicken from Wendy's through Food Panda. This PhP 643 order would feed us until lunch the next day. Noting that we were not really maximizing our time in Manila and I needed to scratch an itch to explore some tourist spots in the Philippine capital, I convinced my brother that we explore Luneta and Intramuros which were not far from our hotel. As we walked to Luneta Park, we chanced upon a kalesa near the intersection of Kalaw Street and Roxas Boulevard as we were about to cross the street towards Luneta. We took some photos at the Rizal monument in Luneta before we negotiated with the kutsero who offered to tour us around for PhP 250 per thirty (30) minutes. We clarified that the amount was for the kalesa and not per person and that we will be able to disembark for photo opportunities. He would sing a different tune as we ended our tour around Intramuros, Binondo (Chinatown), and Quiapo which took around two (2) hours. He tried to charge us double of what we agreed on so I was rabid and called him manloloko (scammer). Initially, I wanted to give him a generous tip but I changed my mind when he tried to scam us. We paid him what was due according to what we agreed on at the start: PhP 1,000 for two (2) hours. Sino ang may kwentong kutsero naglibot sa Maynila? During that Kalesa tour, we made stops to take pictures at the Manila Cathedral and the Galleon Trade Marker. Around the Manila Cathedral was the Plaza de Roma, Palacio del Gobernador, and the Casas Consistoriales or Ayuntamiento de Manila. 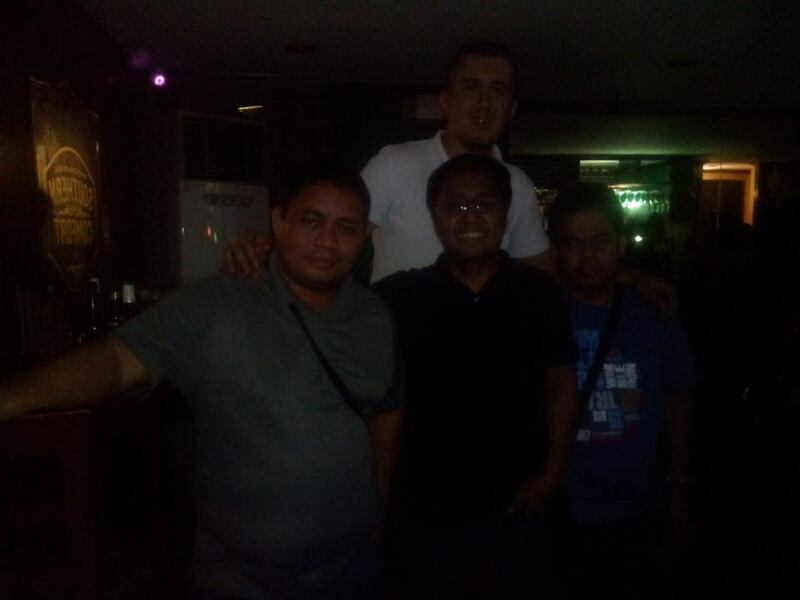 Later in the night, a GrabCar picked us up from the hotel and brought us to The Enterprise in Makati City where we would meet a friend of mine who was a fellow basketball fanatic and one of the active alumni boosters of the UST Growling Tigers men's basketball team. A few years back, I helped UST in recruiting Cameroonian import Karim Abdul who was their reliable center for five (5) years. Marlo treated us to dinner at Jill's near Bonifacio Global City in Taguig. After we met up with my Fil-British friend John Burtonwood, we headed to Rue Bourbon near Burgos Circle in Taguig and Marlo again treated us to beers and a platter of buffalo chicken wings. We went home at 3 a.m. a little buzzed from a fun night. With a slight hangover, we woke up at mid-morning and decided to head out to Robinsons Galleria on foot. We were feeling a little hungry so we looked for a restaurant and ended up with The Shrimp Shack. We ordered the Surf N'Surf and Surf N'Turf which were the house specialties. We did some apparel shopping after and had to wait one (1) hour for modifications on the jeans and slacks we purchased. While waiting, we had General's Chicken for snacks at Recipes. We were supposed to head to Maginhawa Street in Quezon City later in the night but our hosts for that day, Tita Babam and Tito Potpot, got stuck in heavy traffic on their way to our hotel and decided it would be best to just dine in nearby. We decided to eat at the Aristocrat Restaurant in Malate, Manila not far from the hotel. This pre-war restaurant right beside Plaza Soliman is a classic and serves mostly grilled Filipino specials. We ordered native chicken barbecue, pork barbecue, sotangon soup, and paksiw na tiyan ng bangus. After dinner, we marveled at the dancing fountain on Plaza Soliman before we called it a night. Classic and pre-WWII resto in Malate, Manila. Our Sunday host would be our dad's cousin, Tita Meluna, who tagged us along to Sunday worship service at the Christ's Commission Fellowship along Ortigas Avenue in Pasig City. After the service, we met some of our relatives from our dad's side of the family. We rode a bus to Quiapo after sharing a meal, explored some of Plaza Miranda and Quiapo Church, and headed back to the hotel after. In the afternoon, we tried to get to SM Mall of Asia but got caught up in heavy traffic as a part of Roxas Boulevard was closed to vehicular traffic for a Catholic celebration in honor of the Sto. Niño. We ended up heading to the Glorietta Mall in Makati where we printed some documents in preparation for the next day's interview. Dinner was at Chowking in SM Makati, which was right next to the Glorietta Mall. Making sure that all our documents were complete and in order, we slept past 2 a.m. already. Up early for the day that we were waiting for, we had very early breakfast at Chowking before heading out to our 7:30 a.m. interview at the U.S. Embassy. The interview process went by fast and we were done in less than two (2) hours. At 9:30 a.m., we were back in the hotel and caught some forty (40) winks. There was a lunch buffet at the hotel in early celebration of Chinese New Year so we decided to take our lunch there. I enjoyed the Bistek Tagalog so much. Shortly after lunch, we booked our hotel and transfers for Boracay the next day through Dizon Dy Worldwide Travel and Tours along United Nations Avenue. Our plan for the afternoon was to do a sunset cruise but when we got to the Manila Sun Cruises, sunset cruises are only available on weekends. Still optimistic, I convinced my brother that we will just wait to see the world-famous Manila Bay sunset at SM By The Bay. So we looked for a good spot and decided to wait for the sunset while snacking at Razon's. Right after we caught a glimpse of Manila's world-famous sunset, we headed back to our hotel. Tita Meluna invited us to dinner at Emerald Garden Restaurant which was a stone's throw away from the hotel. This was another classic Manila restaurant and it was great pleasure to enjoy their shrimp salad, and fried chicken that came along with shrimp flakes. We capped this day packing up our things as we will be leaving early the next day. 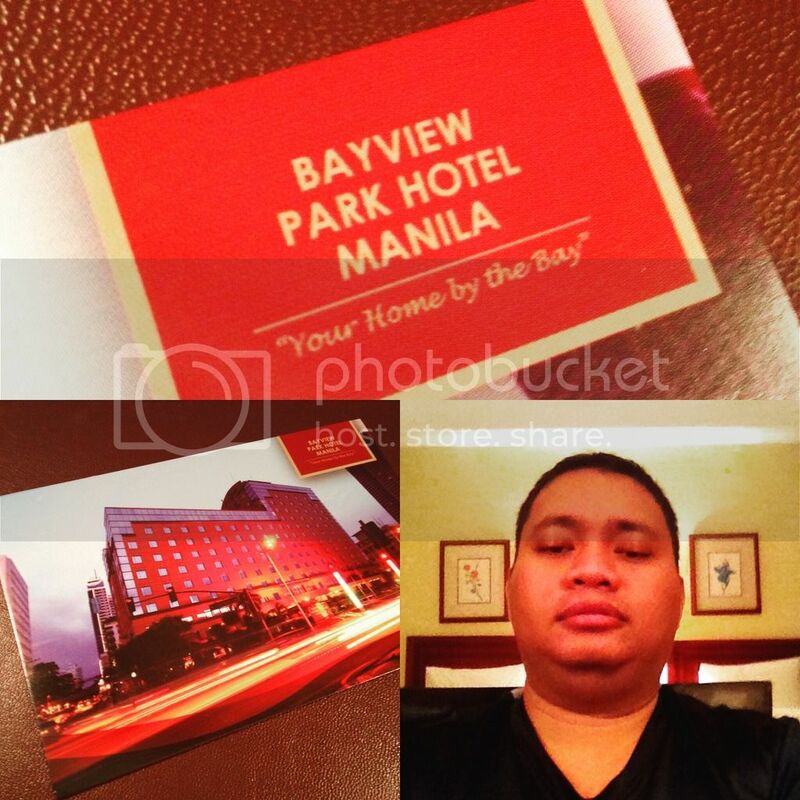 We checked out of Bayview Park Hotel at dawn and took a cab to the airport where we checked in early. A Philippine Airlines flight would take us to Kalibo, Aklan at 8:55 a.m. that day. For breakfast, we had Dutch Chicken and beef stew at Chaikofi inside the pre-departure area. Due to heavy air traffic at NAIA, our flight was delayed for more than thirty (30) minutes. Dutch Chicken and Beef Stew before flying out of Manila. That went by in a whim, didn't it? It made me realize there's a lot more to explore in Metro Manila. I promised myself to go out and explore more the next time I find myself in the National Capital Region.